I am so excited to welcome Christie from Food Done Light. Christie and I have worked together over the years, but just had the opportunity to meet this past October. She is even lovelier in person than I imagined. Be sure to stop by and enter to win the Blendtec 725 Blender that she is giving away! As well as check out Cupcakes & Kale Chips for some Healthy Snacks or Love Bakes Good Cakes for some Healthy Meal Ideas for our #EatHealthy16 Series. Just because you are vowing to eat healthfully, does not mean you cannot enjoy a little dessert now and then. 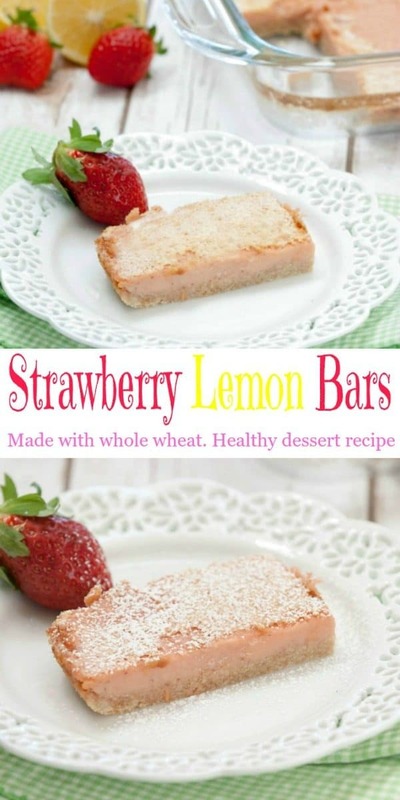 Using better for you ingredients like whole wheat, fresh fruit and less sugar is what these Strawberry Lemon Bars are all about. I always cut out sugar from a dessert recipe. Did you know you can easily cut out 1/4 cup sugar from almost any recipe without noticing any change in taste or texture? Since I’ve been cutting sugar, I find that most desserts are too sweet for me. The first time I realized my sweet tooth did not like things quite as sweet felt amazing. I had set a goal, and I had definite proof that I had achieved it. It felt like winning a gold medal. Ok maybe not quite like winning a gold medal in the Olympics, but it was hugely rewarding. 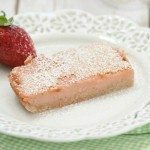 In this recipe I cut the sugar from a normal bar recipe. I also used whole wheat pastry flour to increase the fiber. Lastly, I tackled a little of the fat by using some real butter and more Greek yogurt cream cheese in the crust. 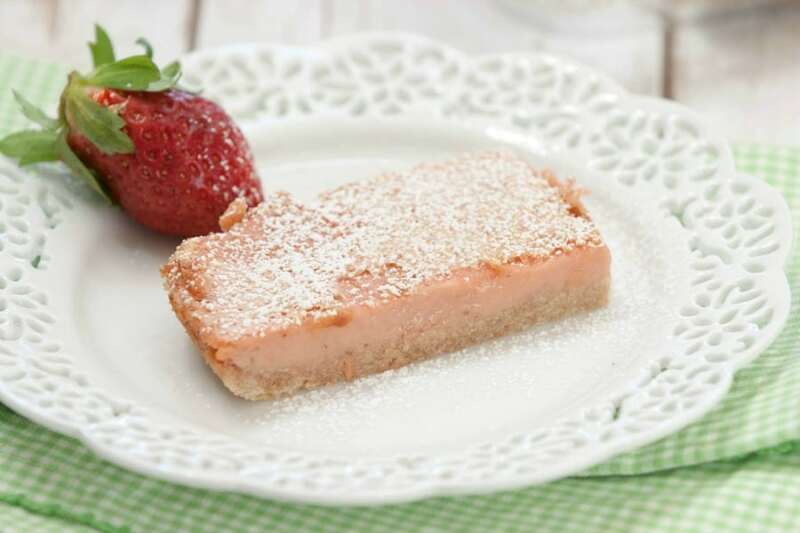 I love that little trick of replacing some real butter with a reduced fat cream cheese and used it in my Strawberry Cream Cheese Oatmeal Bars. 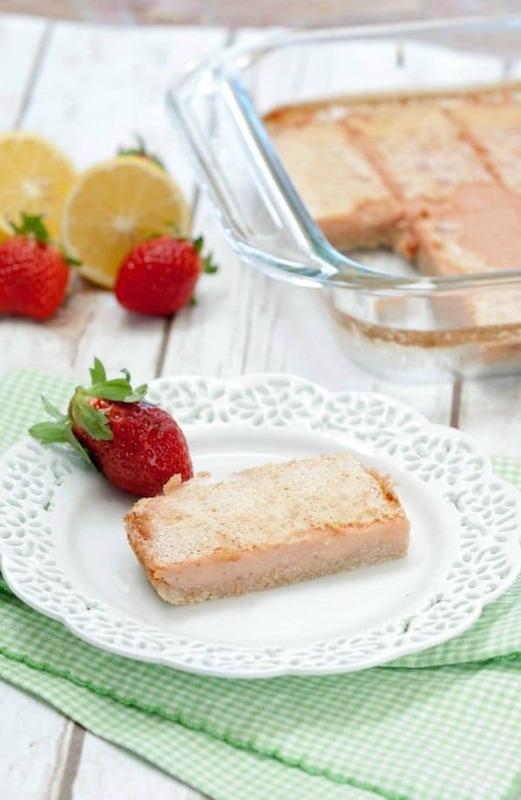 With a few simple swaps, you can still enjoy a little sweet treat in a healthier way. Thanks so much for joining me today. You can find me over at Food Done Light also on Facebook, Pinterest and Instagram. Pop on over and say “Hello” sometime and join in my journey of learning to live healthfully one bite at a time. You can also enter for a chance to win a Blendtec 725 with Twister Jar. Just imagine all the healthy food you could make with this amazing blender. 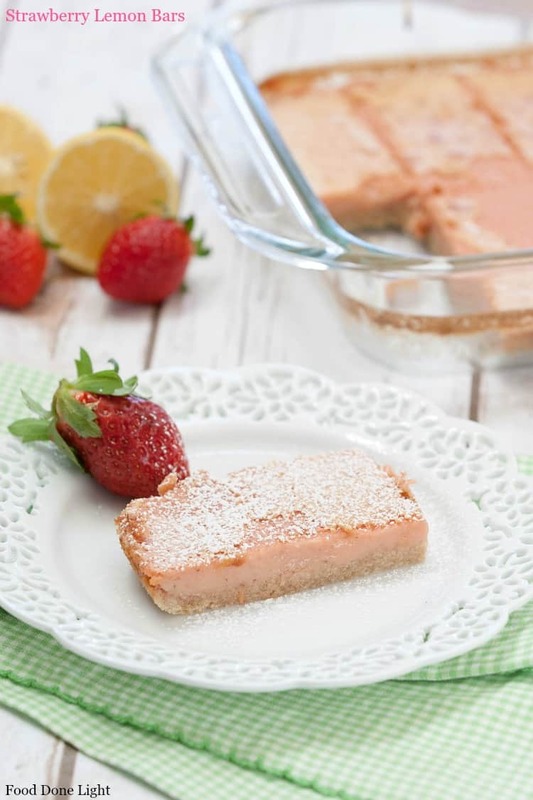 A simply delicious, yet healthy Strawberry Lemon Bar. Preheat oven to 350 F. In a food processor, pulse the flour and brown sugar together until just combined. Add the butter and cream cheese. Pulse again until the butter is pea sized. Add the water and pulse a few more time. Pour mixture into an ungreased 8 x 8 x 2 inch baking dish. Press the crust down and into the corners. Make sure it is packed well. 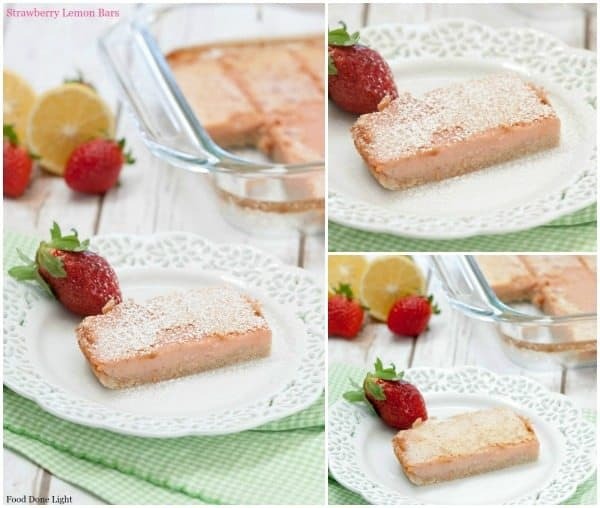 Into the food processor, process the eggs, vanilla, sugar, strawberry puree and lemon juice for 3 minutes, or until light and fluffy. Pour topping over the hot crust. Bake for another 30 minutes. Cool and cut into 12 bars.